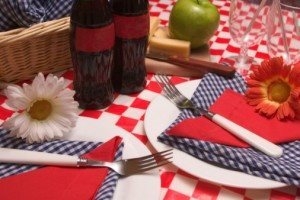 With the 4th of July right around the corner, it’s time to plan your picnic or party. And who can resist a red, white and blue recipe or two? The holiday is a great excuse for some creative cooking. Try this recipe for an appetizer or side. If you’re looking for festive breakfast or dessert options, check out this website. 2. Spray two cupcake pans with nonstick spray and place a tortilla in each cup. Bake in a 250-degree oven for 20 to 25 minutes or until crispy. 3. In a medium sauté pan, brown the ground beef with the onion and remove the extra grease. Mix in the taco seasoning and let sit for 10 minutes to cool. 4. Place a tablespoon of the prepared taco mixture into each shell. Top with Jack cheese, then put a couple of diced red peppers on each taco. Arrange all on a tray and heat in a warm oven until the cheese is melted. Serve and enjoy!